This post will guide you how to use Excel INDEX function with syntax and examples in Microsoft excel. The Excel INDEX function returns a value from a table based on the index (row number and column number). You can use INDEX function to extract entire rows or entire columns. This function is used to combine with the MATCH function to lookup value in a range or array. The INDEX function is a build-in function in Microsoft Excel and it is categorized as a Lookup and Reference Function. 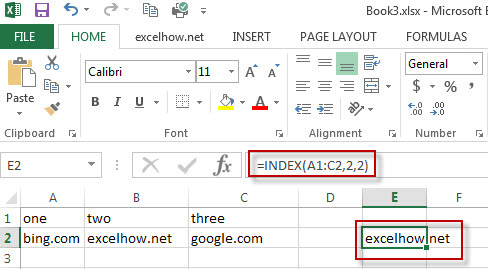 The INDEX function is available in Excel 2016, Excel 2013, Excel 2010, Excel 2007, Excel 2003, Excel XP, Excel 2000, Excel 2011 for Mac. If you want to get the value of a specified cell or array of cell, you can refer to Array form. If you want to get a reference to specified cells, you can refer to Reference form. The array form is used in most cases, and if the first argument of the INDEX function is an array constant, you need to use the array form. If you want to perform a three-way lookup in a range, you can use the reference form. array -This is a required argument. A range of cells or data array. If array contains only one row or column, the corresponding row_num or Column_num argument is optional. Row_num – The row number in data array. If Row_num is omitted, column_num is required. Column_num – The column position in data array. If Column_num is omitted, row_num is required. Area_num – it is set as a number. If the first argument point to more cell ranges, if area_num is set to 1, then the first area will be selected. If you set the row_num and column_num at the same time, the INDEX function will return the value in the cell at the intersection of row number and column number. If you set the value of row_num or column_num to 0, the INDEX function will return the array of values for the entire row or column in the array data. Row_num and Column_num must point to a cell within array data, if not, the index function returns #REF! The below examples will show you how to use Excel INDEX Lookup and Reference Function to return a value from a table based on the intersection of row number and column number. #2 use reference form to extract a value form the second area of C2:D5. Using the following formula. You will see that the intersection of the second row and second column in the second area of C2:D5, which is the contents of cell D3. It returns 149. If you want to find the position number of the last occurrence of a specific value in a column (a single range), you can use an array formula with a combination of the MAX function, IF function, ROW function and INDEX Function. If you want to lookup a value in a range or column and return the cell address of the first match of lookup value, you can use a combination with the CELL function, the INDEX function and the MATCH function…. How do I remove time part from a date in Excel. How to get only date part from the date with time values via Format cells feature or Excel function. How to extract date from a date and time with VBA code in Excel…. Assuming that you have a name range “excelhow”, if you want to sum a specific row (row 2) in named range, you need to create a formula based on the SUM function and the OFFSET function and the COLUMNS function to achieve the reuslt…. If you want to randomly select cells from a range of cells, you can use a formula based on the INDEX function, the RANDBETWEEN function and the Rows function…..